Do you like planting vegetables in your own garden? Have you ever been troubled with planting different plants at the same place? These Planting Pots Have Velcro Window Placket which provides the easy access panel to get out your planted potatoes, carrots, rather than take all plants out. What's more, ventilation holes around and at the bottom provide healthy growing for plants and maintain appropriate water for root, preventing root from rotting and extra watering. Grow Bags prevent roots from circling, decrease risk of transplant shock and reslove different soil needs for various plants. 24 Hours Cutomer Support: Contact us freely about any product or order problem,we will reply with superb service. These grow bags are made of sturdy material, allow roots to breathe and grow healthier, and make plants have really thick stems and healthy roots. You can also observe the growth of roots and seeds from the flap. Ventilated holes on the bottom and side improve aeration, provide better drainage and air flow. But importantly air prunes the roots and helps branch root system out. The size is large enough to create a stable growing environment for veggies and flower. The strong handles make them easy to move around as your needs. 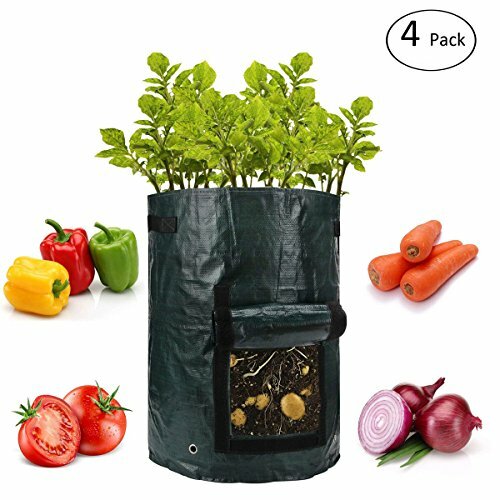 4 Pack vegetable planter bags make planting, growing, and harvesting easier and great for potatoes, onions, carrots, tomatoes flower etc. These bags can easily be used for several seasons and not take up much space when storing.